Still grieving over the tragic death of her fiancé, American wildlife biologist Catherine Sohon leaves South Africa and drives to a remote outpost in northeast Namibia, where she plans to face off against the shadowy forces of corruption and relentless human greed in the fight against elephant poaching. Undercover as a census pilot tracking the local elephant population, she’ll really be collecting evidence on the ruthless ivory traffickers. But before she even reaches her destination, Catherine stumbles onto a scene of horrifying carnage: three people shot dead in their car, and a fourth nearby—with his brain removed. The slaughter appears to be the handiwork of a Zambian smuggler known as “the witchdoctor,” a figure reviled by activists and poachers alike. Forced to play nice with local officials, Catherine finds herself drawn to the prickly but charismatic Jon Baggs, head of the Ministry of Conservation, whose blustery exterior belies his deep investment in the poaching wars. Torn between her developing feelings and her unofficial investigation, she takes to the air, only to be grounded by a vicious turf war between competing factions of a black-market operation that reaches far beyond the borders of Africa. With the mortality rate—both human and animal—skyrocketing, Catherine races to intercept a valuable shipment. Now she’s flying blind, and a cunning killer is on the move. A world-renowned expert on elephants, Caitlin O’Connell holds a Ph.D. in ecology and is a faculty member at the Stanford University School of Medicine as well as director of life sciences for HNu Photonics. She is the author five nonfiction books about elephants, including the internationally acclaimed The Elephant’s Secret Sense, An Elephant’s Life, A Baby Elephant in the Wild, and Elephant Don, and co-author of the award-winning The Elephant Scientist. She is the co-founder and CEO of Utopia Scientific, a nonprofit organization dedicated to research and science education, and the co-founder of Triple Helix Productions, a global media forum with a mandate to develop more accurate and entertaining science content for the media. When not in the field with elephants, O’Connell divides her time between San Diego, California, and Maui, Hawaii, with her husband, Tim Rodwell, and their dog, Frodo. This novel is also a mystery, and you all know I love mysteries. Author Caitlin O’Connell took the sage advice to “write what you know” to heart, and used her own field expertise on elephants to create the setting and background for Ivory Ghosts, and in doing so she follows in the footsteps of people like Arthur C. Clarke, Isaac Asimov, and Kathy Reichs, who all spun their science careers into entertaining, educational, and interesting novels and short stories. O’Connell’s descriptions are so vivid, her sense of place so strong, that when Catherine spent her first night in the ranger station’s less-than-comfortable cabin, I was sweaty and itchy in sympathy. Likewise, the characters she draws feel incredibly real, and completely believable. 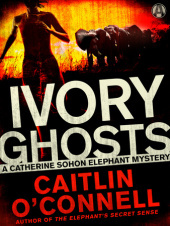 The author’s use of elephant poaching and the ivory industry as both background and plot point made Ivory Ghosts as topical as it was terrifying. Early in the novel, Catherine stumbles upon a murder scene, and things only get more thrilling from there – but Catherine is also shown to be a flawed, feeling, human being, one we care about, root for, and ultimately hope (at least I do) we will get to travel with again. This may be the author’s debut novel, but it reads like something from a seasoned professional, and I really hope O’Connell’s first foray into fiction is as successful as her non-fiction literary career seems to be. Goes well with Ethiopian food (yes, even though it’s a completely different region), especially that tart yogurt, injera bread, and stewed lentils and sweet potatoes, and Tusker’s beer. Monday, April 20th: Bibliotica – That’s ME! Ivory Ghosts, by Caitlin O’Connell #review #giveaway @TLCBookTours by Melissa Bartell is licensed under a Creative Commons Attribution-NonCommercial-ShareAlike 4.0 International License. I have both this and THE TUSK THAT DID THE DAMAGE at the top of my TBR list – I’ve heard great things about both books and I’m really looking forward to reading them.